The V Institute conducts ITI Courses in four disciplines, namely Draughtsman Civil, Surveyor, Electrician and Electronic Mechanic. These courses are sponsored by the Ministry of Labour and Employment, Government of India and affiliated to the National Council for Training in Vocational Trades. The basic qualification for admission is a pass in SSLC. A concise 2-year course in Civil Engineering subjects along with building construction and drawing. The course is conducted by the institute since its inception in 1962. Since then several thousands of students have jointed this course and secured employment in reputed organizations in the area of building construction. Considering the increased opportunity of employment in Surveying especially in the Middle East, the institute also gives training in Total Station Survey, AutoCAD and Quantity Survey as value additions to this course. There are ample employment opportunities in Departments like PWDs, CPWD and Department of Irrigation to mention a few possible employers. A popular one-year course which qualifies a student for ample employment opportunities in our country as well as abroad. Because of this reason large number of students from all parts of the State join this course. A three-week surveying camp is included in the curriculum which helps the students to execute a project. 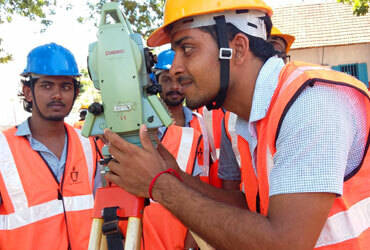 This is an added advantage in that the students get the opportunity to be trained hands-on in Total Station and GPS Surveying which would enable them to secure handsomely paid jobs, particularly in the Gulf countries. The Electrician trade has become very attractive as it enables self employment with little investment. Those who complete this course successfully develop the potential to secure employment in both Government and private sectors. The institute also helps them in obtaining license for undertaking house wiring, load calculations for getting an LT connection, installation of electrical appliances and their repair/ services.